I first became aware of Taylor's mini-comics in 2011 when I picked up a copy of Watermelon, a full-size mini-comic in which she discussed things that related to her experiences as an African American and the expectations and associations that go along with being Black in America. Struck by the frankness of her observations, her honesty, and a loose, sketchy style that reminded me of Panel Patter favorite Katie Omberg, I quickly made a note to keep an eye on her work. In 2012, I found her again at SPX and grabbed a few more of her comics. One of them, Relics, made my 2012 favorites list. I've spoken at length over the years about the ability of the mini-comics genre to give creators the freedom to express themselves without the demands and pressures of a publisher. This means they can talk about absolutely anything they wish. In the case of Taylor, this means looking back at a period of her life she wasn't aware would end up meaning more to her than college. Over the course of five issues, Taylor moves the reader across her life as a teenager, starting with the nerves of beginning high school, her luck at finding friends who were as oddball and geeky as she was, and of course the ins and outs of dating. The theme of relationships continues through the minis, and I could completely relate to the idea of not being able to follow through properly on crushes. Taylor does a great job in Madtown of mixing the funny bits and tragic elements. There's a lot of pages dedicated to pranks (including a great series of torturing the ice cream guy in harmless ways) but we also see what it was like to be in high school during Columbine and 9/11. The latter is especially powerful, because, growing up in Jersey, Taylor and her friends are close enough to drive down to see what's happened. There are also the smaller moments, where a reader can closely relate to Taylor's experiences. She's often unaware of slang (one of the things that happened to me a ton growing up) and puts herself in a vulnerable situation. She talks about her first experience drinking--and puking. But perhaps the most heartbreaking is Taylor's insecurity about dating. Maybe that's just because of how much trouble I had at the same age. It had to be worse for Taylor, though, because she has the added issue of being a minority in an overwhelmingly white school, something she illustrates in an understated manner--simply by her use of shading. Race does not come up all that often in the minis, but when it does, it's very powerful. At a "lock-in" she finally confesses what it's like to be her among the overwhelming white population, and it's like a pressure valve releases for both her character and the reader, as the unstated issue gets the airing she's been holding back. While I cannot relate directly, I do understand how it feels to be the one who's different. It gets easier, as you age, but it never, ever goes away. And in high school, it's maddening. Taylor illustrates this mini-series in her usual way, with sketchy and loose outlines that keep the feel of the characters and places but aren't locked in to rigid form. She gives every character a distinctive look and ensures we know who they are by visual clues, like hairstyle or shirts. Even minor characters get this treatment. Her backdrops set the stage well, and we don't need a lot because it's pretty easy to understand what a high school looks like. Taylor's work is very much in line with her mini-comic contemporaries. This is one of the best mini-comic memoirs I've read in some time. I'd like to thank Whit for sharing them with me in advance of the show, and I urge you to go find her at SPX this year and have a look at her books. There's quite a variety, ranging from the Midtown work to short reflections to commentary. If you like autobiographical comics, make sure you stop by her table. Also: VOTE FOR WHIT IN THE IGNATZ. Going to be at high school instead of SPX? You do know it's Saturday, right? 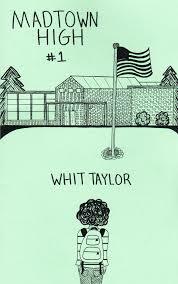 You can find Whit Taylor on the web here, with links to buy her comics.